Colours of Cuba- Photo Series - Travel? Yes Please! One of the things I loved most about Cuba was its vibrancy. It’s a bright and colourful country, a nice change from our dreary winters and beige houses here in Canada. 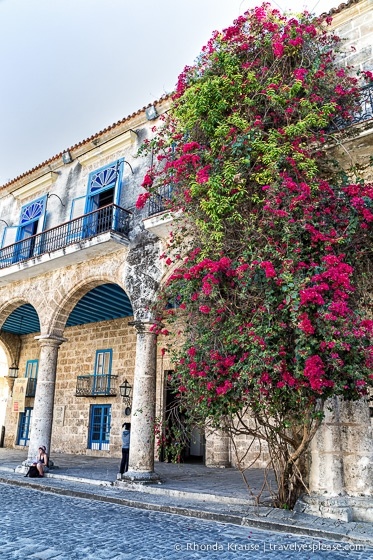 In Havana, pops of colour breathe life into the worn, sometimes crumbling buildings. Classic cars, many with immaculate, glossy paint jobs, drive up and down the Malecón bringing tourists into the heart of Old Havana. Trinidad‘s sunny architecture is sure to bring a smile to anyone’s face and the colourful touches in Cienfuegos’ Parque Marti makes it a pleasant place to relax and people watch. A trip out to Guanayara National Park will have you surrounded by lush trees, ferns and vivid tropical flowers, blending to make up the beautiful scenery of the Topes de Collantes nature preserve. After a busy day exploring all that Cuba has to offer, there’s nothing better than sitting on a beach in Varadero, watching a glowing sunset fade into dusk. Here are some photos from my collection that capture the colours of this wonderful country. I hope you enjoy these vibrant photos of Cuba! If these photos have you wanting to plan a trip to Cuba, you may find our First Time Visitor’s Guide to Cuba helpful. Frank - Fantastic photos Rhonda. We’ve compared notes before on Cuba – but this compilation is really good and covers a few places that we haven’t been.